Gene synthesis is a valid alternative to PCR amplification and cloning of naturally occuring genes. This is especially true when the sequence needs to be modified or parts of it changed. If you wish to string together genes or parts of genes, synthetic genes become even more attractive as you can save yourself the trouble of going through repeated rounds of amplification, restriction, ligation, selection, etc. Standard gene synthesis covers DNA sequences that have an even GS content ranging from 30-70 per cent, no tricky secondary structures, no extended repeats or polynucleotide stretches, etc. - basically your plain vanilla, run-of-the-mill gene. These genes need no sophisticated and enhanced protocols but can be synthesized with established and time-tested procedures that save time and money. Complex genes, on the other hand, usually require significant modifications to existing protocols or completely new protocols. Standard gene with regular GC content: GC content fluctuates between 30 and 70 per cent. Nonetheless, even standard genes can be optimized, either by adapting codon usage to another organism or by tweaking the original gene, e.g. by optimizing control regions, streamlining GC content, etc. Adapting codon use: [Click on the images for a blow-up of the pre-post comparison]. Codon use distribution pre (left) and post (right) codon adaptation with EvoMAG. Not all possible codons are used as a cut-off threshold for codon usage is set to generate a modified (normalized) usage table. 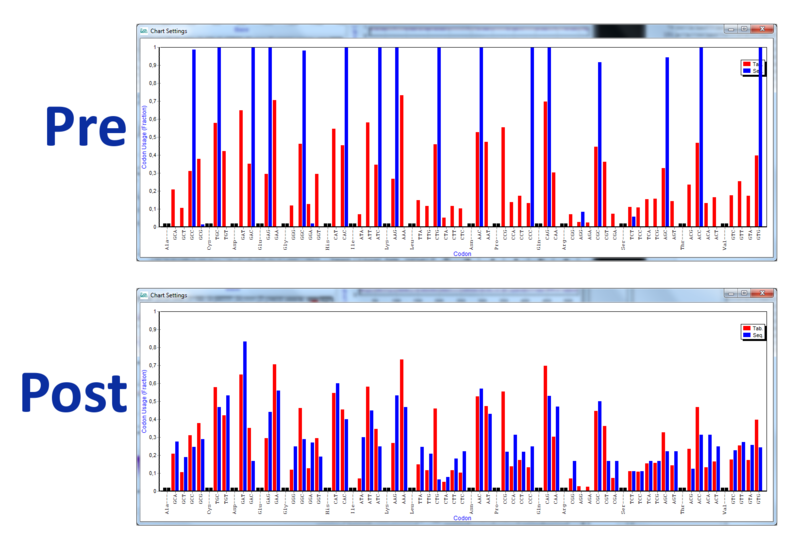 Blue bars represent the tabulated frequencies while the red bars represent the frequencies in the submitted and/or optimized sequence. After optimization the frequency distribution follows the normalized table more closely.